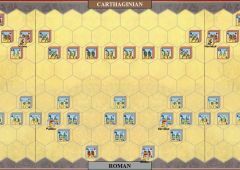 Surprised no one noticed - there should be a 2nd leader for the Romans on the Medium unit to the front right of the Heavy unit on the Left Flank. 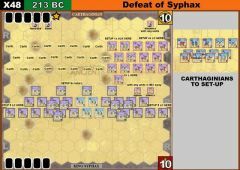 The Scenario in the VASSAL module is also missing this leader. 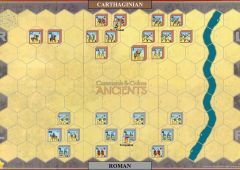 Funny thing is that the block count below the map shows 2 leaders. 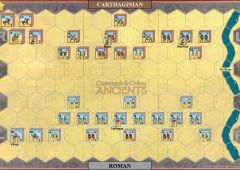 Carthage wins 7- 6 in a very close contest. 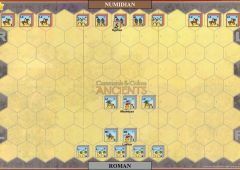 True to life, the Romans attacked on the flanks. 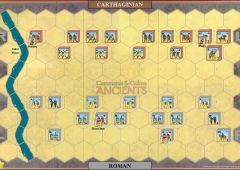 But in the end, Carthage finally pushed through in the center for the win. 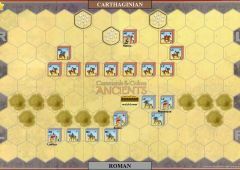 Rome eliminates Carthage's elephants with light missile fire before they can accomplish anything. 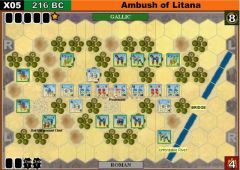 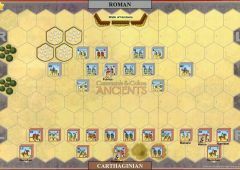 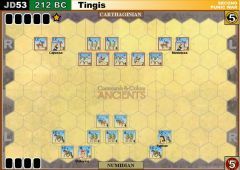 Despite Carthage advancing its main centre body with repeated line advances, the Romans drive against the 'centre flanks' and eliminate auxiliaries and light troops, their officers leading medium foot to repeated victories. 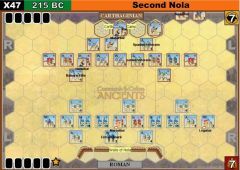 7:2 Roman victory. 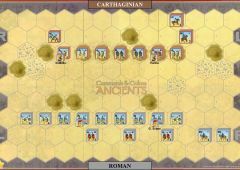 The first couple of turns involved the Romans pushing forward on both flanks and the Carthaginians pushing the center to aid the beleaguered right flank. 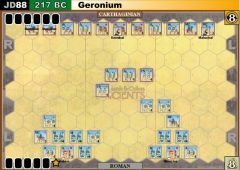 Both sides were able to move medium and heavy infantry forward and inflict heavy loses. 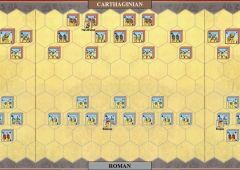 Both elephants were lost without inflicting much damage to the Romans as the Romans pressed the flanks aggressively and the Carthaginians were scrambling to engage units from the center rather than move the elephants forward. 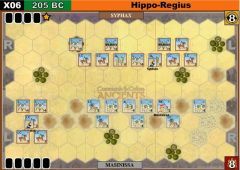 Some lucky shooting did the elephants in. 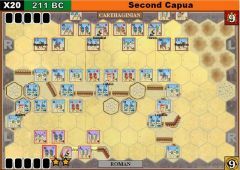 With 4 banners each, both sides had heavy infantry with leaders pressing lighter forces against the baseline. 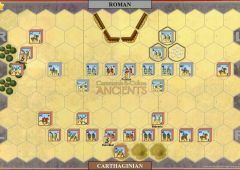 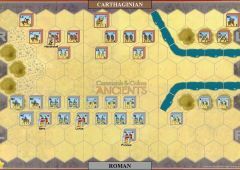 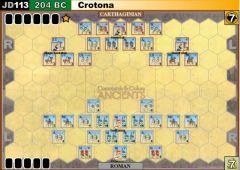 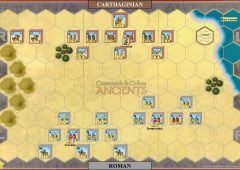 The Romans were pressing with the right flank and the Carthaginians moving against the weak Roman center. 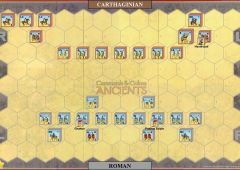 Slightly better command cards seemed to be the difference as the Romans squeaked out a 7-5 victory. 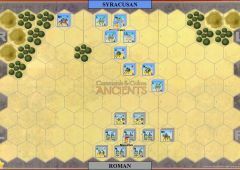 For what was a sweeping victory for Scipio, this scenario plays out very closely. 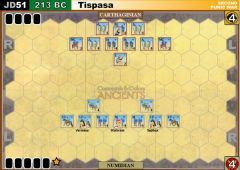 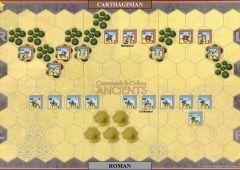 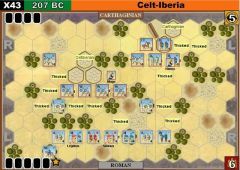 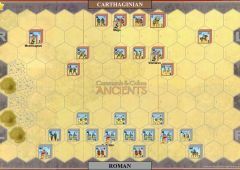 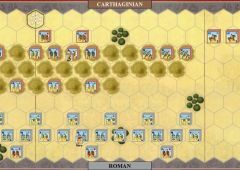 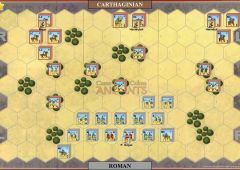 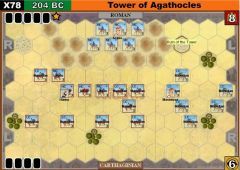 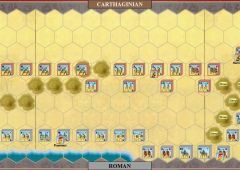 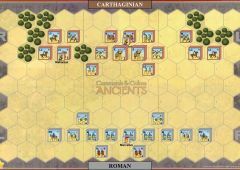 Carthage has a nice selection of units, and the elephants can win this one for Hasdrubal. 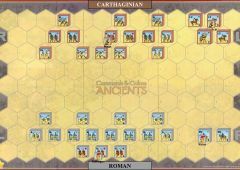 This started off with a mass push by both sides early on. 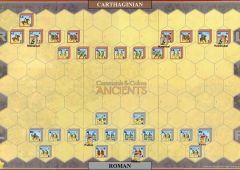 Rome pushed their auxilia forward to complete a line of troops, while Carthage marched forward with a line command. 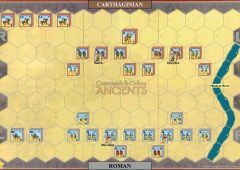 Rome countered with the same setting the battle up to be a blood bath. 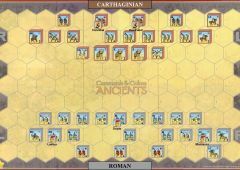 Rome was taking the early lead by massacring the weak light units in the center. 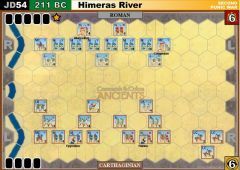 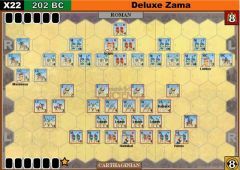 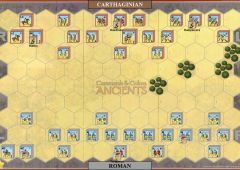 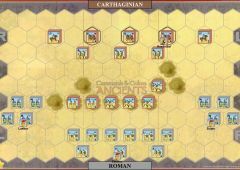 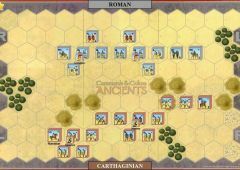 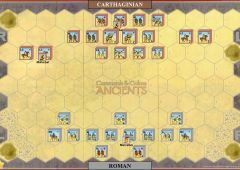 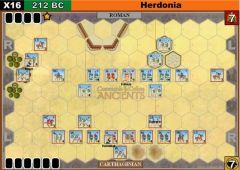 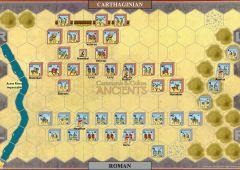 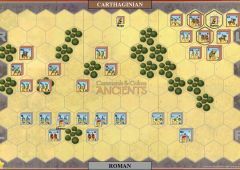 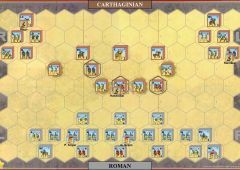 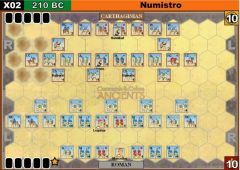 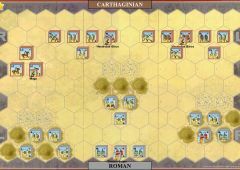 Carthage had a momentary breakthrough after Hasdrubal pushed his heavy units forward into the line. 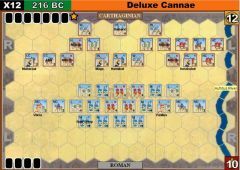 Rome repulsed the initial spearhead and inflicted heavy casualties. 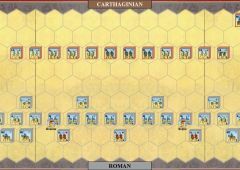 At this point the battle turned, the Carthaginian left flank units ran into a surprising amount of luck and capitalized by cleaning up the Roman right. 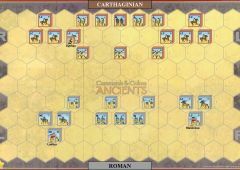 with almost no casualties of their own (as usual the elephants died). 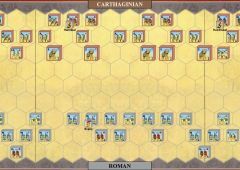 Rome sensing the battle was swinging against them, made an aggressive push with their remaining cavalry to clean up severely weakened units. 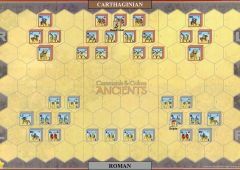 Amazingly, they only managed to eliminate one out of the 5 needed blocks and the battle back left them scattered. 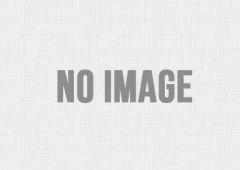 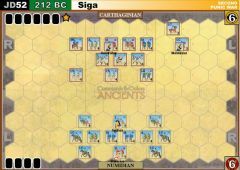 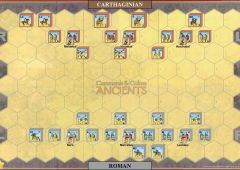 Carthage took advantage and eliminated the weakened cavalry. 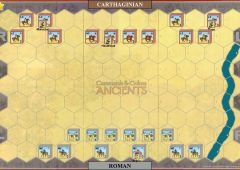 Umm... maybe if the real Hasdrubal was as awesome as this Hasdrubal, Carthage would have stomped all over Rome. 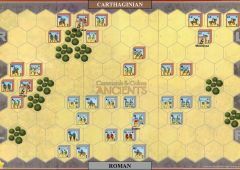 Again, the battle started with very aggressive opening moves by both sides. 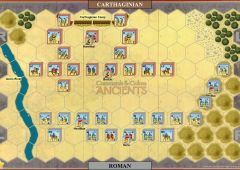 Same thing as last time, Rome gains the upper hand doing some damage and then Hasdrubal pushes through and destroys everyone! 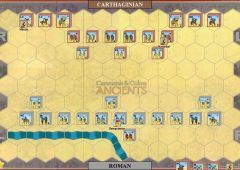 At least this time he was aided by some elephants who were wrecking the Roman right. 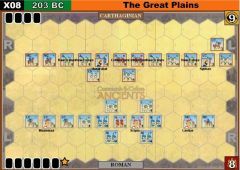 But credit has to go to the general who just wrecked any unit attempting to challenge him. 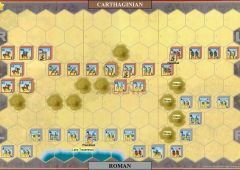 After the first couple of clashes, Rome was just reeling and trying to recover from each Carthaginian attack.